This podcast is a special interview with Stephen Townsend, Director of Network Programs at the Project Management Institute (PMI). In the interview we discussed the recently published book ‘Integrating Program Management and Systems Engineering: Methods, Tools and Organizational Systems for Improving Performance‘. The book is a joint effort between PMI and International Council on Systems Engineering (INCOSE). The book is the product of five years of research and writing by a large team of contributors led by Eric Rebentisch and is both a really solid reference and a guide for integrating the two often conflicting disciplines of program management and systems engineering. In reading the book, I found that it has been put together to read in a consistent way, so rather than being a series of academic chapters, each written by a different contributor or group this work is written with a consistent approach, structure and voice throughout, making it easy to read and follow. The material is well structured and easy to understand and the case studies, drawn from a range of high profile endeavours provide excellent examples of how the integration can be undertaken. Many of our most complex projects are undertaken by teams integrating Program Management and Systems Engineering yet these two critical disciplines often end up with high levels of conflict as they each try to achieve their goals, so guidance that helps organisations do better at this integration, whether it is directly between program managers and systems engineers or between project managers and their various engineering disciplines is critical to a successful future. 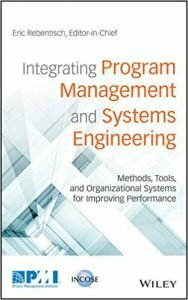 PMI, INCOSE and MIT’s Consortium for Engineering Program Excellence (CEPE) recently ran a free webinar entitled How to Improve Performance through Integration to look at what happens when you integrate program management and systems engineering when managing complex engineering programs which is still accessible here. The book is available for purchase from a number of different sources, here through PMI (where members receive a discount), here via INCOSE (where members receive a discount), via Wiley who are the publishers of the book or from Amazon or most other on line retailers. Stephen is best contacted via PMI, but he did also provide additional contact details in the podcast.